Kahala Mall was getting a bit boring with their food selections until thankfully, The Counter, opened! The Counter is located on the corner next to Whole Foods and across from Chili's. I know everyone goes there for their burgers, but what I love is their Turkey Chili. Unlike the usual chili you think of, there are no beans (YES! ), corn, and topped with dried cranberries. Also comes with a side of rice! There's a lot of chili in one order and can easily be split into two meals. All this for only $6.75. Love it! My parents, who are very cognizant of what they eat, also have deserted the burgers and now go for their sliders. Each order comes with 4 mini burgers, and are a much better alternative to a big piece of burger. They also have a TVs, a full bar, variety of shakes and sides! Get these, Parmesan or regular! Sliders with a side of tempura bacon. Sliders are a go, but the tempura bacon was fatty and REALLY oily. It was a special that month. 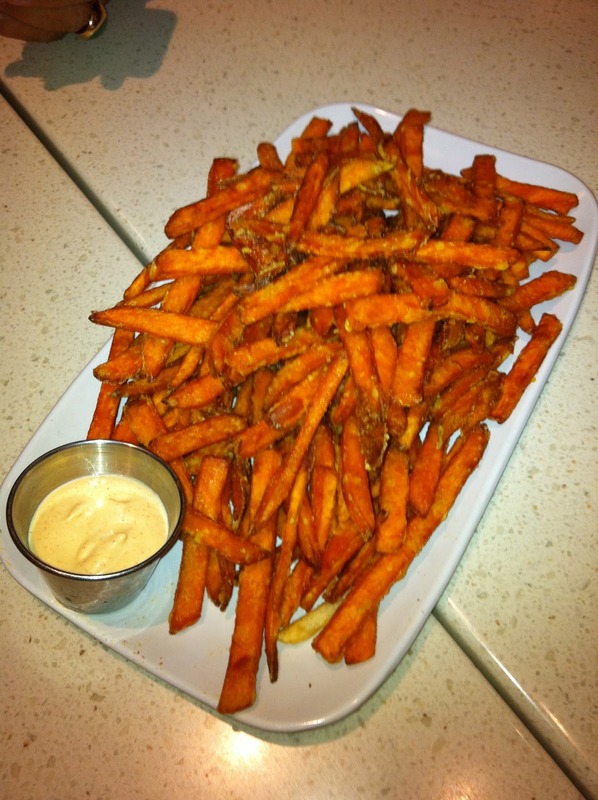 You had me at sweet potatoe fries!! OH YUMMY in my tummy. :) The tempura bacon freaks me out a bit.. ahhhh. don't get me wrong, I heart bacon, but deep fried, whoa!! The turkey chili look delish as well, but I'm a bean kinda girl.. I also put in tons of other veggies when I make turkey chili. Dang girl, now I'm hungry... but it's 12am, so there is no way food is getting into my mouth at this hour.